NEW PRINOTH HUSKY — The Shop Industrial inc. The PRINOTH Husky has been available worldwide for decades and has been a proven leader in the trail grooming industry. With the new redesigned Tier 4 Husky PRINOTH has made this great purpose built machine into an even greater one. 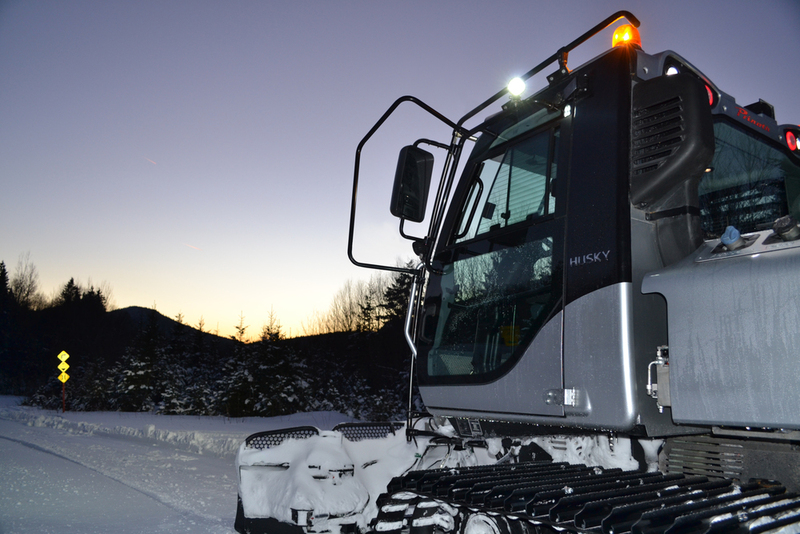 Here is an outline of the significant changes, improvements and differences with the New Tier 4 Husky that will make this machine very beneficial to snowmobile or trail grooming clubs and associations. Tier 4 engine technology is extremely costly but has significant advantages including a reduction of 89% in emissions compared to prior engine technology. In today’s world of ever increasing concern over the impact of global warming PRINOTH has taken this seriously and reduced Nox emissions by 91% and PM (particular matter) by 87.5% making the Husky a Clean Motion pioneer and best in its class. Fuel economy has improved significantly. Tier 4 technology reduces emissions by making the engine perform with far more efficiency, creating more power and burning less fuel. The Mercedes Tier 4 has decreased the engine operating RPM while still giving the Husky loads of power. The New Husky cab is very nice to say the least. It has excellent visibility with its very large windows, upgraded ergonomic controls, and increased lighting for productivity and safety. The mirrors are electrically controlled for fine adjustment increasing the operator’s rear visibility. The overall size of the cab has increased from the previous version which has given the Husky a very spacious interior. This upgraded design has come from the Alpine division of PRINOTH. The Husky’s new cabin suspension and the high level insulation bring a significant reduction of noise level. Raising and lowering the cab is done hydraulically. Pumping to lower the cab aids in operator safety with more control when lowering. 7” Large HD Display for the operator to monitor the functions of the vehicle when operating. Cruise control is standard on the New Husky equipped with steering wheel. The operator is able to set their desired RPM, very beneficial when traveling long distances operating for an extended period of time. The new Husky is now equipped with a snow guard on the front of the cabin to reduce snow dust and increase visibility. When purchasing the new Husky the organizations have the choice of a FNR lever system or a steering wheel configuration. PRINOTH has designed the 12 way blade to be more rugged with bigger pins, and bushings. The NEW HUSKY also boasts numerous enhancements in terms of ergonomics. The user-friendly steering and driving systems help to further optimize work processes and shorten operating times. The PRINOTH joystick is tailored to fit the natural position of the hand. The NEW HUSKY is another shining example of PRINOTH’s CLEAN MOTION philosophy, which is not only synonymous with low energy consumption and sustainability, but it also creates vehicles that boast efficiency, excellent performance, and a long service life.